Here is a wonderful package from the guys at Venus. 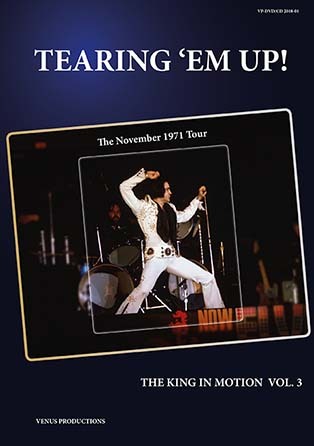 ‘Tearing ‘Em Up’ collectively offers a super 209-page hardback book (with loads of rare and unseen pictures of the complete tour), a stunning DVD and two CDs. 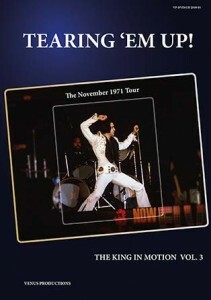 Of paramount interest is the 40-minute DVD containing spectacular footage from Elvis’ November 1971 tour. For completeness sake, the Boston show from November 10th is also included on CD in perfect soundboard quality. Plus the Venus guys have added a free CD to promote the upcoming new CDs in their ‘Unedited Masters’ series. This entry was posted on Sunday, April 15th, 2018 at 1:14 pm	and is filed under Essential Elvis News, General Elvis News. You can follow any responses to this entry through the RSS 2.0 feed.